We admire the virtues which adorned your soul: love of God and neighbor, humility, obedience, patience, purity and the spirit of sacrifice. Help us to imitate your example in our life. Through the goodness and mercy of God, Who has blessed you with so many graces which led you to the true faith and to a high degree of holiness, pray to God for us and help us. Obtain for us a very fervent devotion to the Holy Eucharist so that we may love Holy Mass as you did and receive Holy Communion as often as we can. Teach us also to be devoted to our crucified Savior as you were, that we may cheerfully bear our daily crosses for love of Him Who suffered so much for love of us. Most of all we beg you to pray that we may avoid sin, lead a holy life and save our souls. Amen. Our Father who art in Heaven, hallowed be Thy name, Thy Kingdom come, Thy will be done on Earth as it is in Heaven. Give us this day our daily bread and forgive us our trespasses as we forgive those who trespass against us, and lead us not into temptation but deliver us from evil. Amen. 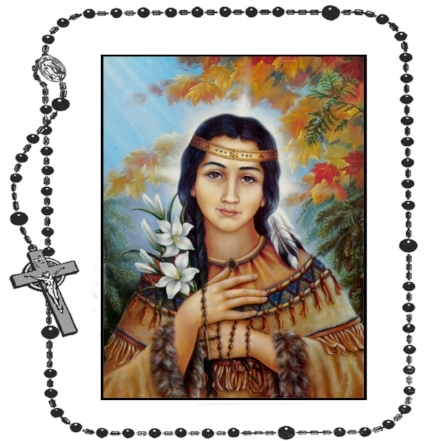 Kateri, Flower of the Algonquins and Lily of the Mohawks, pray for us.